Years ago, Walter A. Henrichsen’s book, Disciples are Made, Not Born, was big in Christian circles. It underscored the need to follow up and nurture young believers. In the same way, leaders aren’t discovered, they are developed. We say that ours is a student-led ministry. But when we don’t find leaders who can step right in, we staff find ourselves hanging onto leadership. It is important to be intentional about leadership development. Freshman Takeover Night. ICYMI, I mentioned this very strategic way of helping freshmen see that they can make a valuable contribution to the movement. Group Talks. If the axiom “Involvement breeds commitment.” is true, this simple small group tactic, helps those who might be reticent to find their voice and contribution. 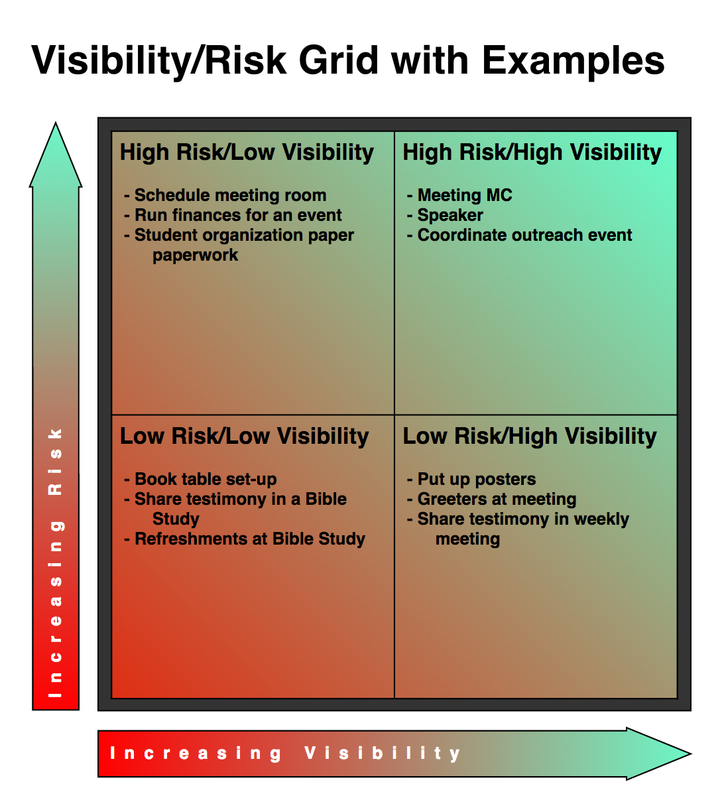 Visibility/Risk Grid. When considering responsibilities for an event, it’s helpful to look at the amount of visibility and risk for each and matching people accordingly. Delegation. This piece by Bob Fuhs offers helpful insight into the delegation process. Beginning the Campus Year Checklist. Using Summer Connect Content this Fall. Destino Connecting Culture and the Gospel. Outreach in real and virtual contexts. This entry was posted in Uncategorized on November 20, 2016 by Gilbert Kingsley.